Crime Scene Slot Review | Fight crimes and win money at the same time! For anyone who enjoys crime shows and detective novels, Crime Scene is one of the best choices in online casino games. Everything about the game supports its theme, including the backdrop, sound effects and symbols on the reels. Fans of the crime genre will notice that the game was inspired by the TV show Crime Scene Investigation (CSI). The backdrop of the game features an occupied body bag cordoned off by police tape, set in a dark, dangerous looking alley. The mood is set by the playing of some haunting music, along with chatter from a police radio that perfectly complements the game’s setting. When it comes to the symbols on the reels, players will see a sticky wild (represented by a police badge) that promises them a chance at some cash winnings which are always tripled. When it appears on the reels it remains in place for as many as five spins. Other symbols that can form to make up winning combinations include a shoe print caked in blood, a briefcase, a gun and sunglasses. Players will notice that anytime a winning combination is achieved they will hear a riff from an electric guitar. Going back to the police badge wild symbol, when players get three of them on the reels at once they get access to the bonus game. This takes them to a new screen where they see a forensics lab in the background, with multiple rows of folders made visible. Players click on each folder to reveal its coin value or evidence symbol, which rewards them with extra coins added to their winnings for the bonus. It continues until a player clicks on a folder that instead of revealing a coin value, simply reveals a red coloured X. In the event that a player clicks on the red X on their first try, they get to then click on one file among a choice of four. If they chose the correct one, they will get to keep playing the bonus game. Players should also be on the lookout for a green V symbol within the file folders, as this symbol essentially acts as a “get out of jail free” card to keep them in the bonus game a little longer than they would have been otherwise, by cancelling out the red X. 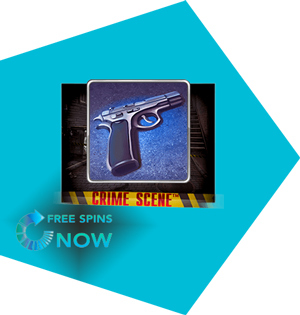 With so many crime-themed slot machines, Crime Scene is often said to be one of the best. It is just intriguing and interactive enough that even players who may not necessarily enjoy crime shows will enjoy the game. In terms of graphics and sound effects, Crime Scene is extraordinary. Though it isn’t available for mobile devices, players seem impressed enough with it to log onto their desktop or laptop computer in order to access the game. This speaks volumes as to how intriguing and appealing the game is to a wide variety of players. Games like this one are the reason that many players now prefer online casinos to offline casinos.